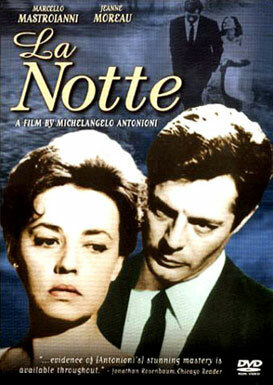 Unravelling like a cool and melancholic jazz riff, Antonioni’s La Notte charts the slow yet inevitable demise of a marriage between a successful Italian author named Giovanni Potano (Marcello Mastroianni) and his beautiful wife Lidia (Jeanne Moreau). At the outset, the rift between the pair is almost imperceptible but it widens dramatically over the course of one day and night after a visit to a dying friend. Lidia fees the hospital in distress and Giovanni soon follows but is waylaid by a wild nymphomaniac. He is about to succumb when the nurses arrive and slap the wanton woman into submission. It’s this taming of sexual impulses and numbing of passion that Antonioni dwells on as he follows Lidia through the back blocks of Milan and later, with Giovanni, through the upper echelons of high society in search of lost inspiration. Wandering the landscape of her youth, Lidia sees a group of young men firing off sky rockets and another gang engaged in a fight. Their virility contrasts sharply with that of her husband. But Giovanni is also blocked; “I no longer have inspirations,” he declares, “only recollections”. At a decadent all-night party he meets the ravishing Valentina, daughter of the host, and believes he has found his muse but by dawn she is exhausted by both he and his disillusioned wife. Valentina is played by Antonioni’s own muse, Monica Vitti, who also featured in the other two films in his ‘isolation trilogy’, L’Avventura and L’Eclisse. When we meet her she is reading ‘The Sleepwalkers’, a book about people living in a nether region between crumbling and emerging ethical systems, a space not at all unlike that of a relationship breakdown. Shot in moody black and white, La Notte plays like a blues song full of empty promises of love and modernity.